this is a game where students guess the job from the description. Student reads one sentence if another student guesses correctly it's 3 points, 2 points if guessed on 2nd sentence and 1 point for last sentence. 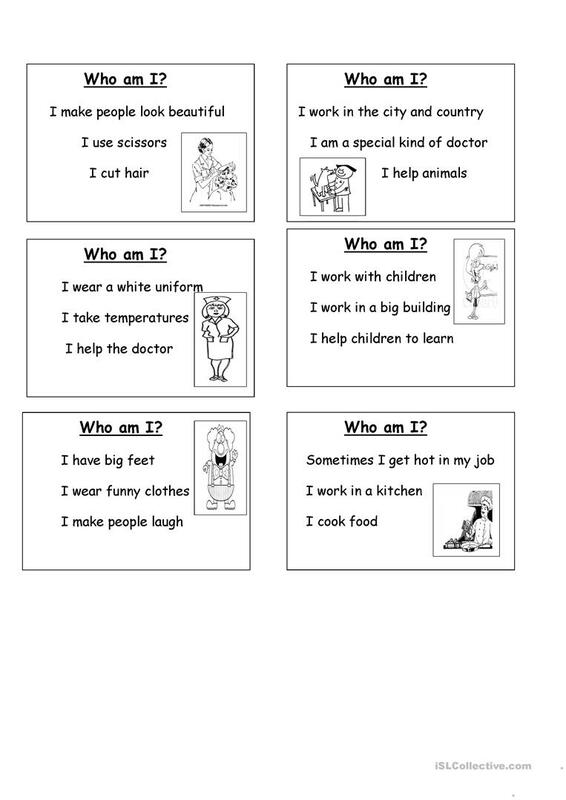 The above downloadable handout is intended for elementary school students and kindergartners and nursery school students at Elementary (A1) and Pre-intermediate (A2) level. It was designed for improving your pupils' Listening, Speaking and Reading skills. It focuses on the topic and words of Jobs, work. adiri is from/lives in United Kingdom and has been a member of iSLCollective since 2013-03-05 11:34:10. adiri last logged in on 2019-04-20 03:29:06, and has shared 69 resources on iSLCollective so far.